Dr. Atef Sayed Abdel-Razek Mohammed is currently working as Research Professor at National Research Centre (NRC), Cairo, Egypt. He obtained his Ph.D. in Entomology from Cairo University, Egypt. He also worked as Professor of Biology at the Faculty of Applied Sciences, Islamic University, Al Madinah Al Monawara, Kingdom of Saudi Arabia, and also act as a Research Staff in the project of Microbial Control of Insects Infesting Oilseed Crops between Agriculture Canada and Egyptian National Research Centre (sponsored by the International Development Research Centre, IDRC, Ottawa - (Canada). He was received the National Research Centre Encouragement Prize in Agricultural and Biological Sciences for the year 2006. He also participated in number of scientific meeting. He also participated in number of national and international projects as Principal Investigator, Co-principal Investigator and Member of Research team. He also supervised 3 MSc thesis. 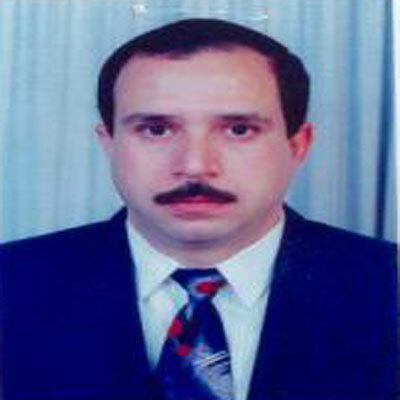 He is member of scientific societies such as Syndicate of Scientific Professions, Entomological Society of Egypt, The Arab Association for Youth and Environment, Cairo, Egypt, The Egyptian Association for Scientific Culture of Egyptian Scientific Union, Egyptian - German Zoological Society, Egypt, Egyptian - Canadian friendship Society, and The Egyptian Society of Parasitology. He has published 42 articles in journals contributed as author/co-author. Talkhan, F.N., H.H. Abo-Assy, M.M. Azzam and A.S. Abdel-Razek, 2013. Activity of delta-endotoxin protein crystals in Bacillus thuringiensis mutants when influenced by UV treatments. Arch. Phytopathol. Plant Protect., 46: 1346-1358. Talkhan, F.N., H.H. Abo-Assy, K.A. Soliman, M.M. Azzam, A.Z.E. Abdelsalam and A.S. Abdel-Razek, 2013. Biochemical and multiplex PCR analysis of toxic crystal proteins to determine genes in Bacillus thuringiensis mutants. World Acad. Sci. Eng. Technol., 7: 511-516. Abdel-Razek, A.S. and M.M.M. Abdel-Gawad, 2013. Effects of entomopathogenic nematodes on suppressing hairy rose beetle, Tropinota squalida Scop. (Coleoptera: Scarabaeidae) population in cauliflower field in Egypt. World Acad. Sci. Eng. Technol., 79: 517-521. Abd-Elgawad, M.M.M., A.S. Abdel-Razek and A.E. Abd El-Wahab, 2012. Efficacy of kaolin, entomopathogenic nematode and Fungi on the Mediterranean fruit fly infesting Citrus. Egypt. J. Agronematol., 11: 178-192. Azzam, M.M., A.Z.E. Abdelsalam, F.N. Talkhan, K.A. Soliman and A.S. Abdel-Razek et al., 2011. Identification of some Bacillus thuringiensis isolates by PCR and their potential against the cotton leaf worm. Funct. Plant Sci. Biotechnol., 5: 52-56. Salem, S., A.S. Abdel-Razek and H.S. Salama, 2009. Evaluation of a pheromone-lure trap for monitoring distribution of the red palm weevil, Rhynchophorus ferrugineus Oliv. (Coleoptera: Curculionidae) in date palm plantations in Egypt. Open Entomol. J., 3: 37-41. Salama, H.S., F.N. Zaki and A.S. Abdel-Razek, 2009. Ecological and biological studies on the red palm weevil Rhynchophorus ferrugineus (Olivier). Arch. Phytopathol. Plant Prot., 42: 392-399. Abdel-Razek, A.S., M.H. Abbass, E.A. Abdel-Hakim and W.L. Abdou, 2009. Combining neem plant extracts and Bacillus thuringiensis to control three stored product pests. J. Plant Environ. Sci., 2: 59-63. Abdel-Razek, A.S. and M.M.M. Abd-Elgawad, 2008. Effects of entomopathogenic nematodes on suppressing hairy rose beetle, Tropinota squalida Scop., (Coleoptera: Scarabaeidae) population on cauliflower in Egypt. Proceedings of the 4th Scientific Conference of the Agricultural and Biological Research Division, May 5-6, 2008, National Research Center, Dokki, Giza, Egypt, pp: 27-. Abd-Elgawad, M.M.M. and A.S. Abdel-Razek, 2008. Effects of entomopathogenic nematodes on population of diamondback moth, Plutella xylostella Linn. (Lepidoptera: Plutellidae) infesting cabbage. Egypt. J. Agronematol., 6: 207-215. Abdel-Razek, A.S. and S.A. Mohamed, 2007. The role of bacterial symbionts in suppressing the defence reaction in larval hemolymph of the cotton leafworm Spodoptera littoralis (Biosd.). Arch. Phytopathol. Plant Protect., 40: 423-430. Abdel-Razek, A.S. and M.M.M. Abd-Elgawad, 2007. Investigations on the efficacy of entomopathogenic nematodes against Spodoptera littoralis (Biosd.) and Galleria mellonella (L.). Arch. Phytopathol. Plant Protect., 40: 414-422. Abdel-Razek, A.S., M.H. Abbas, M. El-Khouly and A. Abdel-Rahman, 2006. Potential of microbial control of diamondback moth, Plutella xylostella (Linnaeus), (Lepidoptera: Plutellidae) on two cabbage cultivars under different fertilization treatments. J. Applied Sci. Res., 2: 942-948. Abdel-Razek, A.S., Abdel-Rahman, E. Karima, El-Sharkawy and A.A. Manal, 2006. Comparative biological activity of the residual Bacillus thuringiensis strains against a susceptible laboratory strain of pink bollworm, Pectinophora gossypiella Saunders,(Lepidoptera: Gelechiidae). Res. J. Agric. Biol. Sci., 2: 243-248. Abdel-Razek, A.S., 2006. The role of the different fermentation media and infection processes on the infectivity of the bacterial symbionts to Spodoptera littoralis (biosduval) (Lipedoptera: Noctuidae). Arch. Phytopathol. Plant Protect., 39: 353-363. Abdel-Razek, A.S., 2006. Infectivity prospects of both nematodes and bacterial symbionts against cotton leafworm, Spodoptera littoralis (Biosduval) (Lepidoptera: Noctuidae). J. Pest Sci., 79: 11-15. El-Lebody, K.A. and A.S. Abdel-Razek, 2005. Evaluation of the residual effects of the microbial insecticide, Bacillus thuringiensis subspp. alone or mixed with phthorimaea operculella granulosis virus (POGV) against Pectinophora gossypiella (Lepidoptera: Gelechiidae). Bull. Entomol. Soc. Egypt. Econ. Ser., 31: 215-228. Abd-Elgawad, M.M.M. and A.S. Abdel-Razek, 2005. Susceptibility of the cotton leafworm, Spodoptera littoralis(Lepidoptera: Noctuidae), to different heterorhabditid nematodes and their bacterial symbionts. Egypt. J Agric. Res., 2: 457-472. Abdel-Razek, A., K.E. Kamel and H.S. Salama, 2004. Biochemical effects of the nematode-bacteria complex on the red palm weevil, Rhynchophorus ferrugineus (Olivier)(Coleoptera: Curculionidae). Arch. Phytopathol. Plant Protect., 37: 205-214. Abdel‐Razek, A.S., 2003. Pathogenic effects of Xenorhabdus nematophilus and Photorhabdus luminescens (Enterobacteriaceae) against pupae of the diamondback moth, Plutella xylostella (L.). Anzeiger fur Schadlingskunde, 76: 108-111. Abdel-Razek, A.S., O.N. Morris, N.D.G. White, H.S. Salama and A. El-Moursy et al., 2002. Comparative Histopathology of Plodia interpunctella (Lepidoptera: Pyralidae) and Tribolium castaneum (Coleoptera: Tenebrionidae) As affected by Bacillus thuringiensis Varieties Indiana or Morrisoni. Arch. Phytopathol. Plant Protect., 35: 307-320. Abdel-Razek, A.S., 2002. Protection of stored cowpae, Vigna unguiculata (L.) from infestation with cowpae weevil, Callosobruchus maculatus ( F.) (Coleoptera: Bruchidae). J. Egypt. Ger. Soc. Zool. (E) Entomol., 39: 13-20. Abdel-Razek, A.S., 2002. Pathogenicity of bacteria symbiotically associated with insect pathogenic nematodes against the greater wax moth, Galleria mellonella (L.). Arch. Phytopathol. Plant Protect., 35: 53-60. Abdel-Razek, A.S., 2002. Comparative study on the effect of two Bacillus thuringiensis strains of the same serotype on three coleopteran pests of stored wheat. J. Egypt. Soc. Parasitol., 32: 415-424. Abdel-Razek, A.S. and S. Gowen, 2002. The integrated effect of the nematode-bacteria complex and neem plant extracts against Plutella xylostella (L.) larvae (Lepidoptera: Yponomeutidae) on Chinese cabbage. Arch. Phytopathol. Plant Protect., 35: 181-188. Salama, H.S., S.A. Salem, F.N. Zaki and A. Abdel‐Razek, 1999. The use of Bacillus thuringiensis to control Agrotis ypsilon and spodoptera exigua on potato cultivations in Egypt. Arch. Phytopathol. Plant Protect., 32: 429-435. Abdel-Razek, A.S., H.S. Salama, N.D.G. White and O.N. Morris, 1999. Effect of Bacillus thuringiensis on feeding and energy use by Plodia interpunctella (Lepidoptera: Pyralidae) and Tribolium castaneum (Coleoptera: Tenebrionidae). Can. Entomol., 131: 433-440. Abdel Razek, A.S., 1998. Biological efficacy of some commercial and isolated varieties of Bacillus thuringiensis on the development of Cadra cautella Walker and Tribolium confusum Jacqueline du Val on stored crushed corn. Bull. OILB/SROP, 21: 67-74. Salama, H.S., R. Aboul-Ela and A.S. Abdel-Razek, 1996. Persistence of Bacillus thuringiensis σ-endotoxin and β-exotoxin on stored grains and their products against Plodia interpunctella and Sitotroga cerealella. J. Applied Entomol., 120: 249-254. Salama, H.S. and A. Abdel‐Razek, 1992. Effect of different kinds of food on susceptibility of some stored products insects to Bacillus thuringiensis. J. Applied Entomol., 113: 107-110. El-Moursy, A., R. Aboul-Ela, H.S. Salama and A. Abdel-Razek, 1992. Chemical additives that affect the potency of endotoxin of Bacillus thuringiensis against Plodia interpunctella. Int. J. Trop. Insect Sci., 13: 775-779. Salama, H.S., R. Aboul‐Ela, A. El‐Moursy and A. Abdel‐Razek, 1991. Biology and development of some stored grain pests as affected by δ‐endotoxin and β‐exotoxin of Bacillus thuringiensis. Biocontrol. Sci. Technol., 1: 281-287. Salama, H.S., A. El-Morsy, R. Aboul-Ela and A. Abdel-Razek, 1991. Potency of different varieties of Bacillus thuringiensis (Berl.) against some lepidopterous stored product pests. J. Applied Entomol., 112: 19-26. Salama, H.S., A. El‐Moursy, F.N. Zaki, R. Aboul‐Ela and A. Abdel‐Razek, 1991. Parasites and predators of the meal moth Plodia interpunctella Hbn. as affected by Bacillus thuringiensis Berl. J. Applied Entomol., 112: 244-253. Aboul-Ela, R., M.Y. Kamel, H.S. Salama, A. El-Moursy and A.S. Abdel-Razek, 1991. Changes in the biochemistry of the hemolymph of Plodia interpunctella after treatment with Bacillus thuringiensis. J. Islamic Acad. Sci., 4: 29-35.